Instagram has become an endless album of toned and fit women who leave you clueless and wondering whether that’s real or plastic? For the past year, I’ve found a certain pleasure in following athletes and fitness advocates on Instagram because, for some reason, it feels real. You watch their daily struggles, the way they ferociously fight back and the results are undeniable. It gives you hope that your 2013 new year resolution of fitter thighs and abs might actually happen in 2019. One of my favorite ladies across the social media platform is Tracy Harmoush. Raised and born in Denver, Colorado, the Lebanese-American started her own business, moved to Lebanon, and quit her 10-year-long career in investment banking. 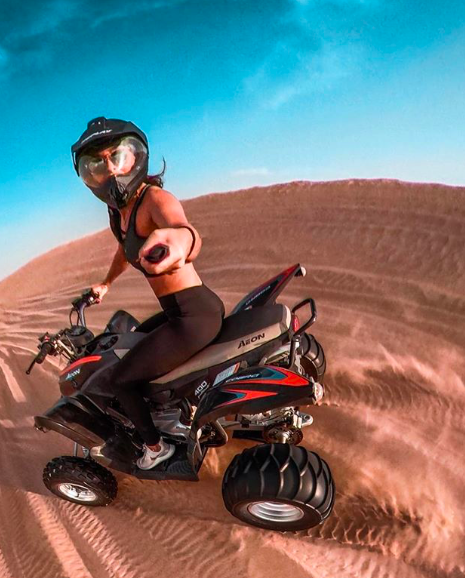 Harmoush runs weight training and inversions workshops across the region, as well as a company, Untraceable, which is all about adventure and adrenaline rushes. But let’s talk about her Instagram account. First of all, there is an image of a handstand every other post. It’s like she spends a major part of her day upside down working her core. Somehow she managed to do the impossible; a toned and firm as a rock body that still looks curvy and feminine. I’m sorry but how, when, and why? She makes you want to bring out your inner bad girl, hop on a motorcycle, and disappear in the desert, along with your adrenaline. Her sidekick and workout buddy is a parrot. And guess what, Nike actually asks for the bird in her posts, while we can’t even afford Nike’s sportswear! You get that? Her bird is endorsed by Nike. Sigh! WE SAID THIS: Dear Instagrammers, take it easy on the highlights, contours, and fillers. Start working out and be a Tracy.